Over the past few years, a unique cultural climate has developed around food. Food obsession, facilitated largely through a boom in network TV cooking programs, countless online food bloggers, and a rise in artisanal quality food products (and even home producers), has become so commonplace that a new sect of society has been born: ‘foodies’. This vast audience with a cult-like devotion to food has elevated chefs to celebrity status, and created an incredible network of people all tuned-in to revere and receive any information they can about the innovative uses of food. Simultaneously, the food justice movement has gained leverage and expanded exponentially, and the timing and setting could not be more primed for broadcasting their message. With Community Supported Agriculture continuing to gain in popularity and the work around California’s Proposition 37 in 2012, to name just a couple examples, the movement has a broad reach. The culture of food and the need to pay attention to its transformations is at the forefront of the mission of the Center for Genomic Gastronomy (CGG). By capitalizing on both the trends of the foodie movement and the urgency of the food justice movement they are raising awareness about the hazards of biotechnology in our food system in amazingly creative ways. By taking a systems approach to food, and combining that with their background in biohacking, the brains behind the CGG are nudging us to consider food in ways we never have. They have taken this weird science under the microscope, and broadcast its gritty truths with social and environmental relevance. The CGG’s work is exceptional, in that it encourages us not only to think about and understand the effects of the potentially hazardous and altered food we’re eating, but to actually eat it. In their TEDXDublin talk, CGG co-founders said, “when you change people’s tastes, you change their assumptions and expectations.” By combining art, food and technology in such phenomenon’s as glow in the dark sushi, these folks are breaking the barriers of food justice education and information sharing in ways that we’ve never seen. In this video we get a glimpse into how to interact with some of CGG recipes. Below, one of the CGG’s co-founders, Zack Denfield, explains to us their latest endeavors and projects. The bizarre and fascinating works of this group are constantly asking us to question the origins and the futures of the foods we eat. The Center for Genomic Gastronomy is an independent research institute that explores the genomes and biotechnologies that make up the human food systems on planet earth. Our mission is to map food controversies, prototype alternative culinary futures, and imagine a more sustainable, just, biodiverse and beautiful food system. The Center presents its research through public lectures, publications, meals and exhibitions. So far in 2013 we have been primarily conducting research, and are now starting the process of bringing this new body of research out of the studio and into the world. In addition to running a pop-up food hacker lab in Portland, Oregon in May and June we are currently scheduled to exhibit our projects publicly at the Portuguese Architecture Triennale in September and the San Jose Museum of Art in October. What follows are snapshots of two projects. The first project, Cobalt-60 Sauce, documents an historical food controversy that is not very well known. The second project, FoodPhreaking, is a new publication we are releasing that looks at current food practices as a guide for imagining open source food cultures of the near future. The Center for Genomic Gastronomy is very interested in documenting and reexamining the hype, hope and controversies that surrounded food & biotechnology in the recent past. Cobalt-60 Sauce is a project that examines mutation breeding, and documents some of the radiation-bred plant varieties that are served as food on a regular basis. We have written a bit about mutation breeding, and have created work with and about mutagenic varieties, but this is the first time that we will bring together many mutagenic plants to grow an cook with. The hype and hope surrounding mutation breeding in the 1950s and 1960s parallels more recent developments in the life sciences, including transgenics and synthetic biology. Starting in the 1950s novel plant varietals have been created by exposing plants to radioactive materials such as Cobalt-60, with the hopes of inducing “interesting” mutations, and thereby speeding up the slow process of selective breeding. After being exposed to radiation, mutagenic plant varietals were chosen based primarily on observable phenotypical characteristics. Compared to synthetic biology and transgenics, this process of designing life was much less instrumentalized and precise. Today, many mutagenic plant varieties have been approved for sale as food but their history is largely unknown by the general public, and even by contemporary biotechnologists. Luckily, the International Atomic Energy Agency (IAEA) keeps records of the many mutation bred varieties that have been created by different countries. The Center’s project, Cobalt-60 Sauce, is a barbecue sauce made exclusively from mutation bred plants that were exposed to Cobalt-60 and which can be found in IAEA’s META database. We are bringing this research to the public in the form of an installation. The Cobolt-60 Sauce installation has four main components. 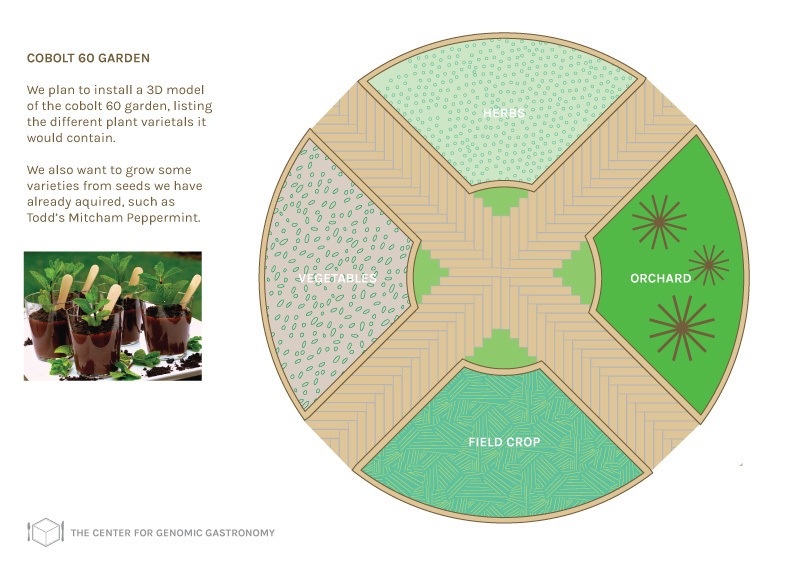 On one table, mutagenically bred plant varieties (such as Todd Mitcham’s Peppermint) will be growing. The second table will showcase a 3D landscape model of a larger demonstration garden proposal. The third table will exhibit a crate of the Cobolt-60 Sauce. The packaging lists the mutagenic plant varietals that are used to make the sauce and points to the IAEA’s META database. A warning label explains that the mutation-bred plant ingredients have not gone through the rigorous human or environmental health testing that many commercialized transgenic plant varieties undergo. Is this risk acceptable? 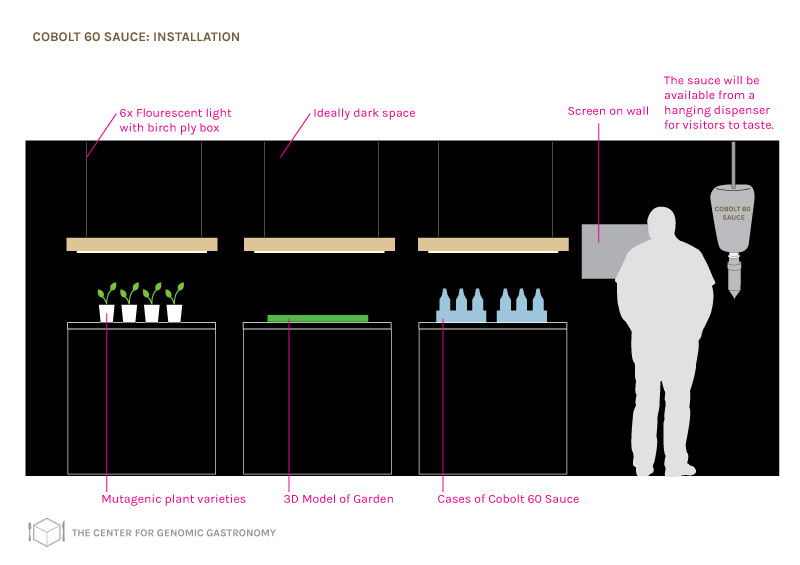 Lastly, there will be a screen on the wall showing a film that presents the history of mutagenic breeding. We are interested to see how collecting these disparate plants in one demonstration garden, and one sauce leads to new conversations and critiques. The idea of trying to ‘Engineer Biology’ is not a new one, and Cobalt-60 Sauce offers an opportunity to pause and consider one historical precedent as we continue to debate emerging biotechnologies. One goal of our organization is to make connections between gastronomy, ecology and open culture. 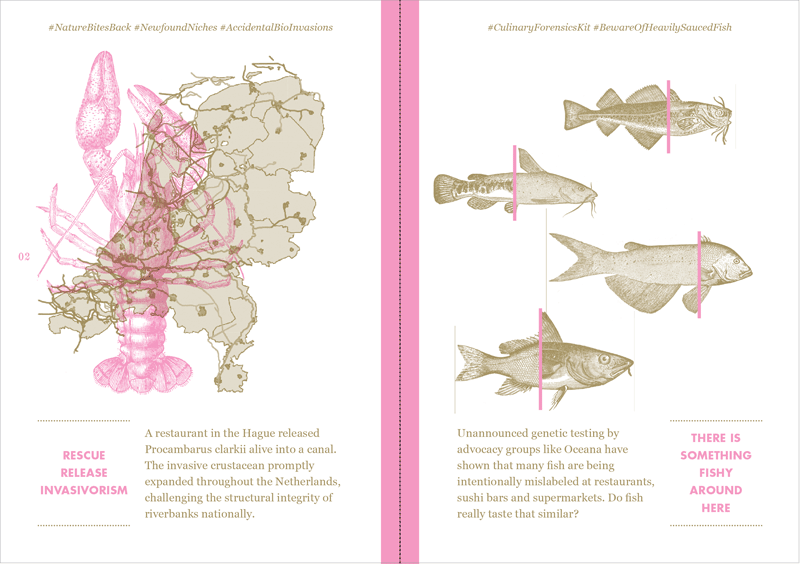 The FoodPhreaking journal is a publication that aims to connect foodies who care about sustainability with scientists and hackers who care about open culture. For the first issue (Issue #0) we decided to collect 40 concise examples of what FoodPhreaking might be, and what it most definitely is not. Regular readers of the Center’s blog supplied us with links to examples of critical amateurs and hobbyists obsessed with exploring the food system, and recent failures in the global food system. These examples have been grouped into themes such as Culinary Civil Disobedience and Proprietary Food Science. 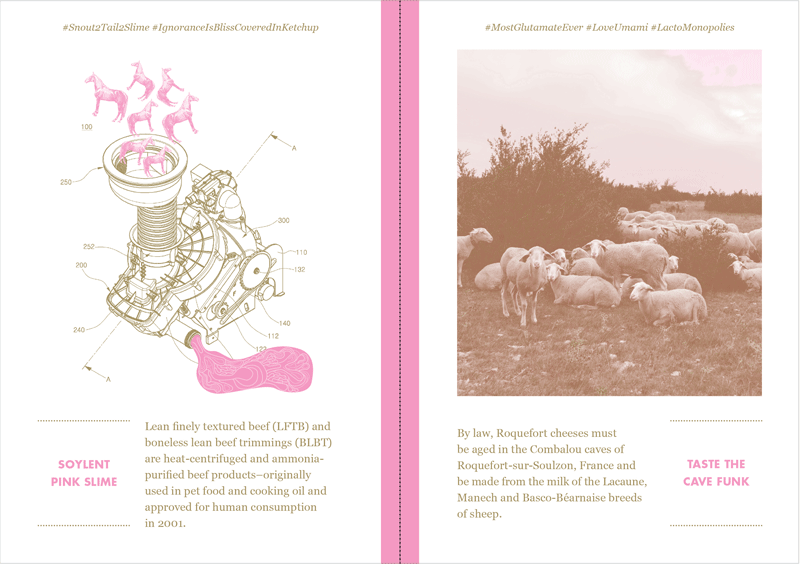 FoodPhreaking issue #0 is currently being printed using a 2-color risograph process with gold and neon pink ink. We love well crafted print publications that inspire readers who are moved by flipping through ink on paper. However, for ease of use and distribution a creative-commons-licensed digital version of the book will also appear on our website later this month. We hope you are in touch if you run into interesting examples that we should include in future issues of the FoodPhreaking journal. Cobalt-60 Sauce looks at a controversy from the recent past and FoodPhreaking examines the present to imagine a better food future. These are just two of the projects that are migrating from research phase to dissemination phase. You can follow many more upcoming projects by visiting our website or joining our mailing list.